Introduction: Minimal invasive techniques such as laparoscopic appendectomy (LA) are thought to produce better cosmetic results. 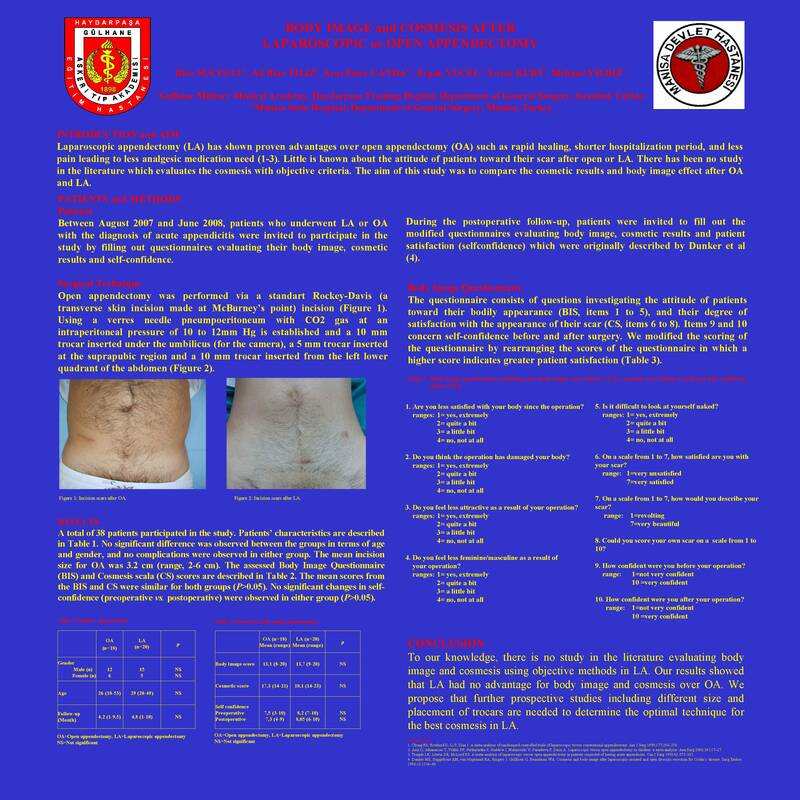 This aim of this study was to evaluate the body image n cosmesis of patients after LA and open appendectomy (OA). Methods and procedures: Between August 2007 and June 2008, patients who underwent LA or OA with the diagnosis of acute appendicitis were invited to participate the study by filling out the body image questionnaire. For OA, patients who had Rocky-Davis incision and for LA patients who had the operation by three trocars (10-mm infraumbilical, 5-mm suprapubic and additional 10mm left lower quadrant) were included the study. Patients with the pathologies other than acute appendicitis, having McBurney or vertical incisions, having prior abdominal surgery, who had conversion to open exploration during laparoscopy, and in whom different number and positioned trocars used were excluded from the study. Student’s t-test and paired samples t-test were used for statistical analysis.